Today's prompt over at NaBloPoMo is a great one: If you were trapped in an elevator, which three bloggers would you most want with you in that situation? My only problem is that its a hard choice! I'm picking 2 bloggers that I don't know (other than reading their blogs) and one that I do. You should always have a real friend with you I think. 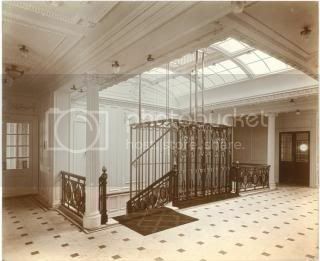 Oh, and for the sake of argument, we're going to say its one of those old cage type elevators so we could see outside, get food passed in to us and get someones attention if we had to. See picture on the left if you don't know what I'm talking about. Ok. I'll start with the real friend. Tegan over at Twelve13 - is a friend of mine from High School. I really enjoy reading her blog and keeping up with her and her family - and we were able to meet up for coffee earlier this week which was great. She'd be great company if we were stuck in an elevator. Next would be Ilana, aka Mommy Shorts. Since becoming a mom, I am addicted to her blog and instagram feed. Her kids are adorable... and she seems to have a great sense of humor. I'm sure she'd come up with a great post and some great instagram pictures if we were stuck in an elevator. Last and not least is Joanna over at A Cup of Jo. I have been enjoying her blog for years. Which is saying alot because I always feel like as my life changes - my favorite blogs do to. But this has been a constant. She always has interesting things to share and talk about. Ok, those are my choices. Of course, I think Tegan and I would have to make a trek to NYC to get stuck in a elevator with the other two. I don't think they are coming to Sacramento. Anyone else ever notice that the really great bloggers are all in NYC? I am FINALLY getting caught up enough to comment on this post I've had bookmarked forever! I love your elevator description. :) And I'm up for a trip to NYC!